South Korea and the U.S. confirmed their differences in the first round of talks to revise their bilateral free trade agreement(FTA). The session began at 10 a.m. Friday at the office of the U.S. Trade Representative in Washington. 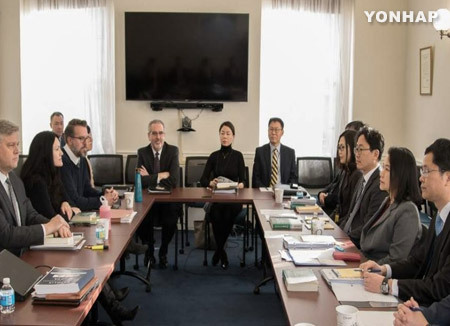 The negotiations were led by Yoo Myung-hee, director of trade policies at Seoul’s Trade Ministry and Assistant U.S. Trade Representative Michael Beeman. The Ministry of Trade, Industry and Energy in Seoul said discussions focused on areas of mutual interest and sensitive sectors. After the talks, Yoo told reporters that the United States expressed interest in the automobile sector. South Korea is known to have presented the investor-state dispute settlement and trade remedies as areas of interest and explained its position on sensitive areas, including agro-fisheries trade. Speaking to reporters when she arrived in Washington earlier on Thursday, the Korean chief delegate vowed to put priority on national interest and seek a balance of interest with the U.S. According to Reuters, following the first round of talks, USTR Robert Lighthizer remarked that there’s much work to do to reach an agreement that serves the economic interests of the American people. The negotiations will continue with an interval of three to four weeks and the venue alternating between Seoul and Washington but it’s unclear when an agreement will be reached. The South Korea-U.S. free trade agreement took effect in 2012.